Wow—it has been a busy two weeks since I last wrote. But, true to form, I have not been resting on my laurels! Since the Color Run, I have run a few “shorter” races to vary my running schedule as I gear up for my next two big races, the Ragnar Relay DC on 9/21 and the Marine Corps Marathon on 10/28. 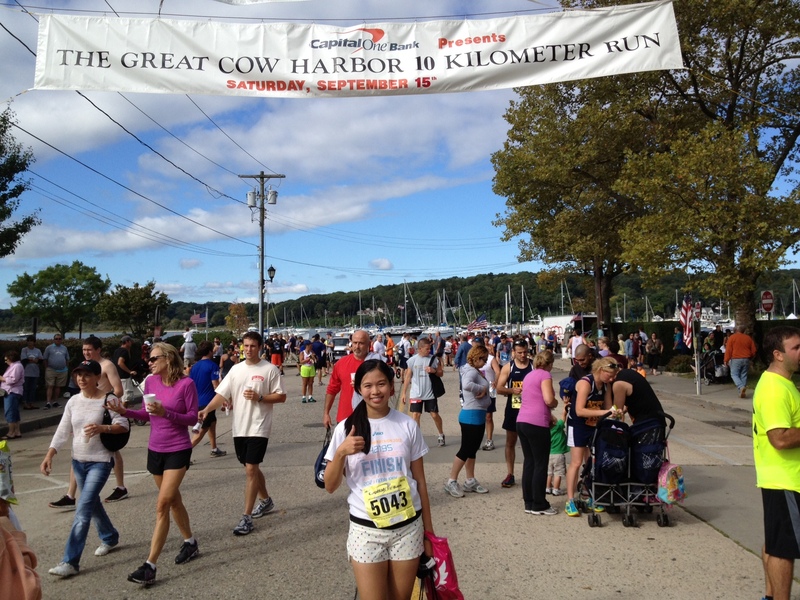 I have run the Back to Football 4-miler, the New Haven 20K road race, and the Great Cow Harbor 10K. 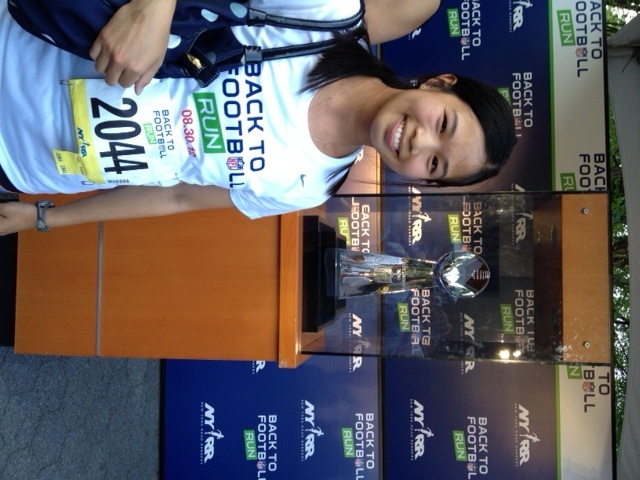 The next race after the Color Run was a weeknight race, the Back to Football 4-miler in Central Park on 8/30! 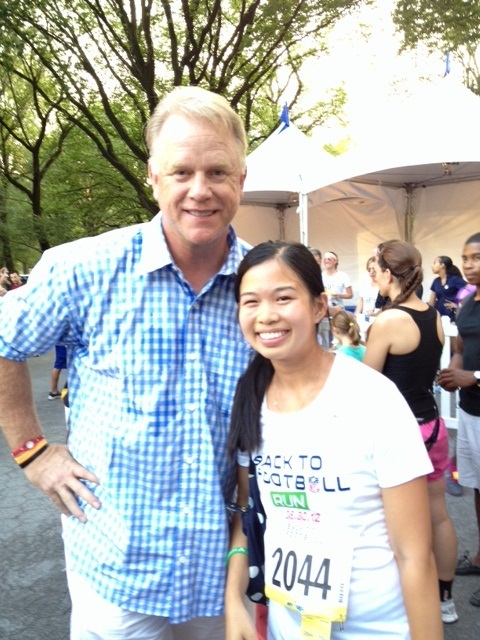 I had a blast, got to meet football legend Boomer Esiason, and ran a solid race (34:22, or 8:36 pace), helping the Dashing Whippets women win third place. It was my first team medal (I was the 4th scoring member out of 5), so I was thrilled. Right after the race, I went to a foodie event called Brisketlab and enjoyed a big plate of Brisket from Daniel Delaney BBQ. Yum!! Me and the Vince Lombardi trophy–go Giants!! 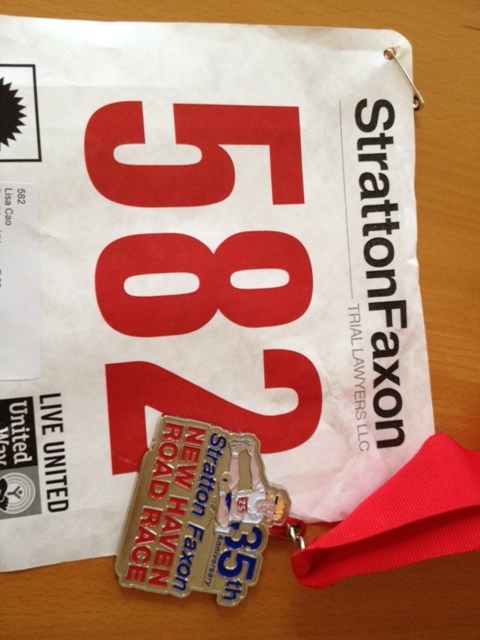 On Labor Day weekend I ran the Stratton Faxon New Haven 20K Road Race, my first 20K ever! I like doing a new distance because I can automatically set a personal best. It was a gorgeous day for running, and we even got finisher medals! I ran a 1:54:35, or 9:17 pace. I was happy with my time, considering the slow recovery I had from the 100-miler. I love the Doonesbury illustration on the medal by Garry Trudeau! 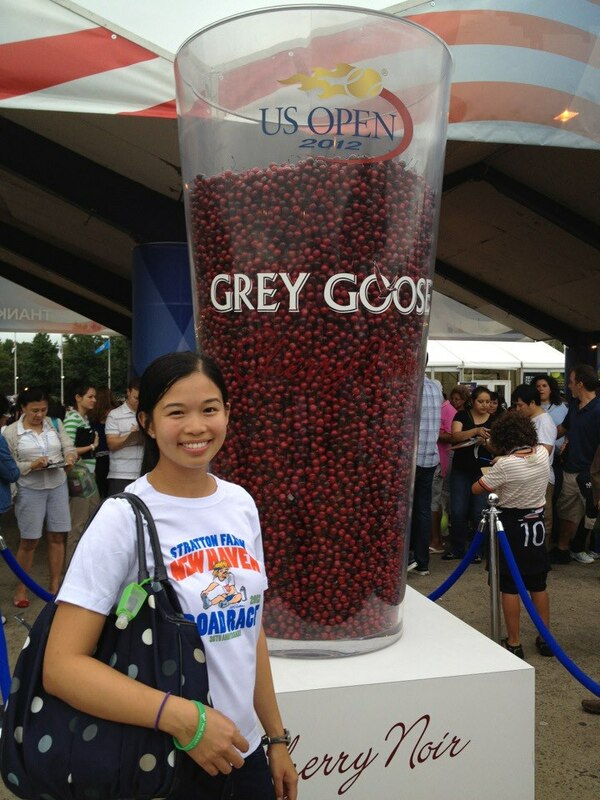 That same day, I headed back into Manhattan from New Haven and then went to the US Open for the first time ever. I got to see the Williams sisters play in tennis doubles (against Victoria Azarenka and someone else) on one of the smaller courts (such a cool, intimate experience), then I headed to Arthur Ashe stadium an hour later to see Andy Murray win his match against a Canadian tennis player (sorry, I’m such a novice—the opponent’s name escapes me). Arthur Ashe was overwhelmingly huge. 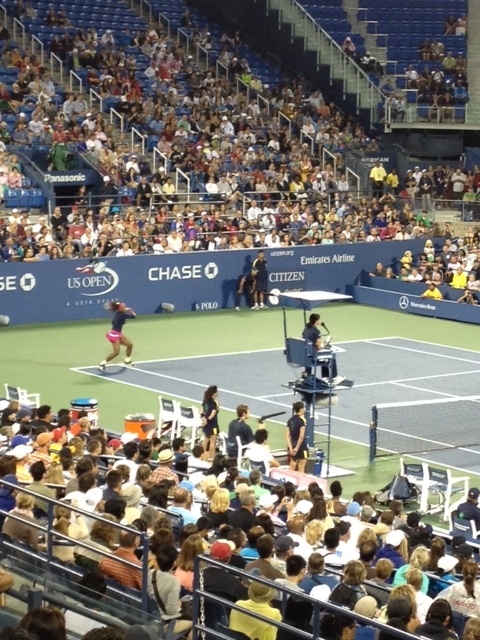 Serena Williams at the US Open! It was my first time at the US Open! On Thursday, 9/6/12 I enjoyed Fashion’s Night Out with Jacqueline and Christie, getting free stuff and getting our nails done while gallivanting around town in stylish dresses and fascinators. The highlights of the night were going to Henri Bendel, getting a Swarovski crystallized iPhone case with purchase, going to Mulberry for manicures, tote bags and elderflower soda, and going to Diesel for drinks, tote bags, and photo ops. 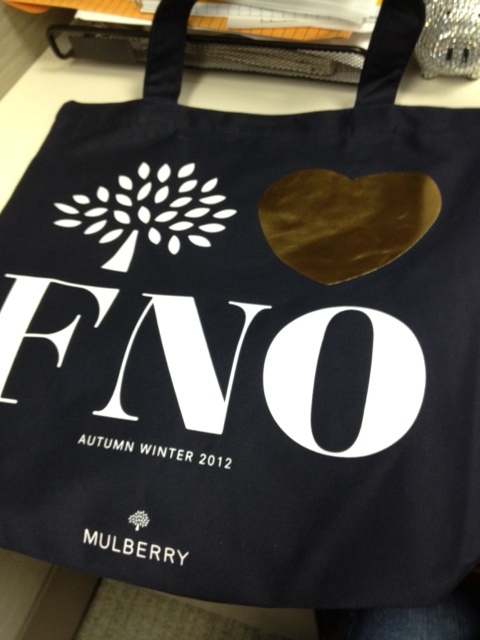 Mulberry FNO tote. The other side had a hairy gold monster on it. 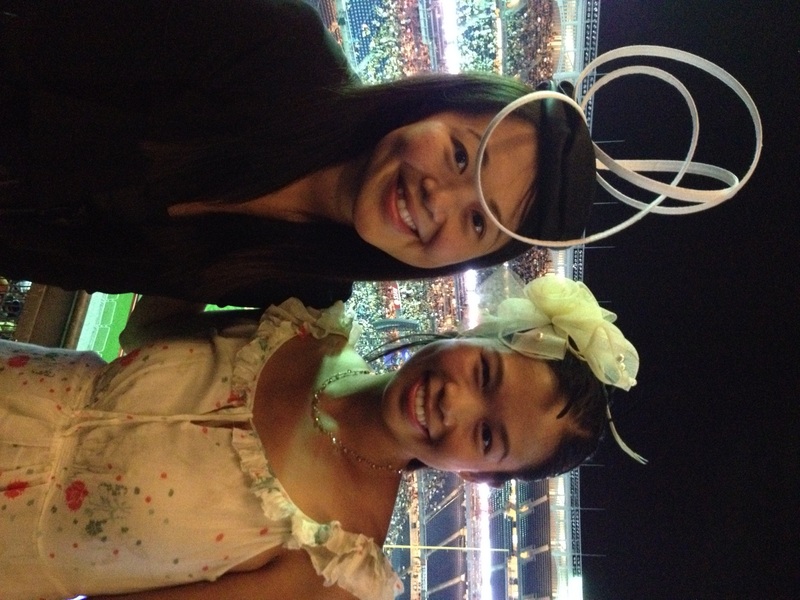 Jackie and I enjoyed FNO for two hours before heading to the Madonna concert (MDNA Tour) at Yankee Stadium! We got there at 9pm, an hour late, but Avicii was still spinning and we made it in time for the best song, “Le7els.” Madonna finally took the stage around 10:20am and OMG the opening scenery was so dramatic and good. The stage was set up like a huge cathedral, with massive wrought iron gates that slowly opened to reveal Madge herself. She started with her new song “Girl Gone Wild,” and then sung favorites like “Celebration,” “Vogue,” and “Like a Prayer.” I was so glad I went to the concert—it was my first time watching Madonna live and I was in awe the whole time. Her set lasted from 10:20pm-12:30pm but I had to leave at midnight because I was so exhausted from the week’s events. This past weekend, I visited my friend Emily R’s family in Northport, Long Island. They have a beautiful oceanfront home and it was an amazing place to relax and get away from the city for a bit. 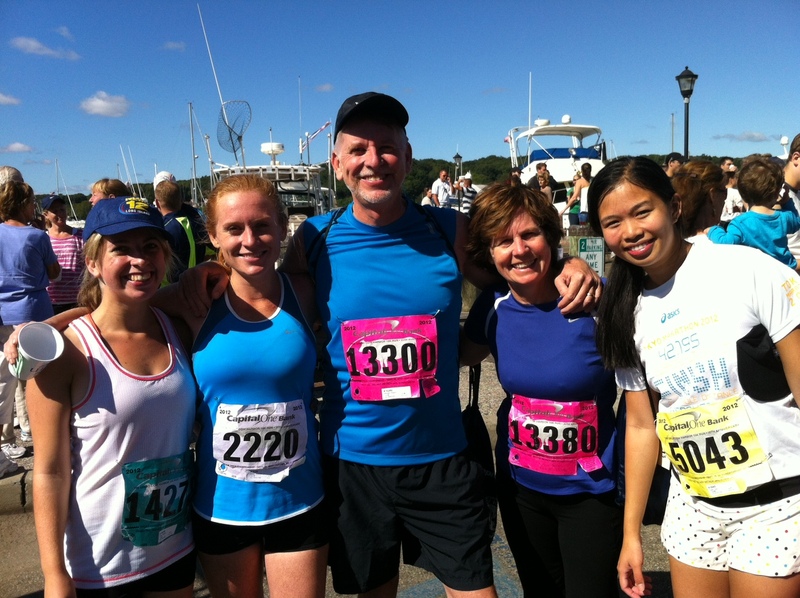 I stayed over a night and then we got ready to run the Great Cow Harbor 10K on Saturday, 9/15. It was an awesome, well-organized race with views of the ocean and a world-class field. I just tried to have fun with it and enjoy the experience, and I ended up being really happy with my 53:13 effort on a hilly course. The weather was overcast and perfect for running, and there was an awesome post-race festival with tons of food and beer! I was proud of Emily for her great personal best, and it was a joy to run with her parents (her mom ran her first race ever!) and her younger sister Anna! After the race, Emily and I made some delicious toasted pecan and banana pancakes, potato salad and corn salad. 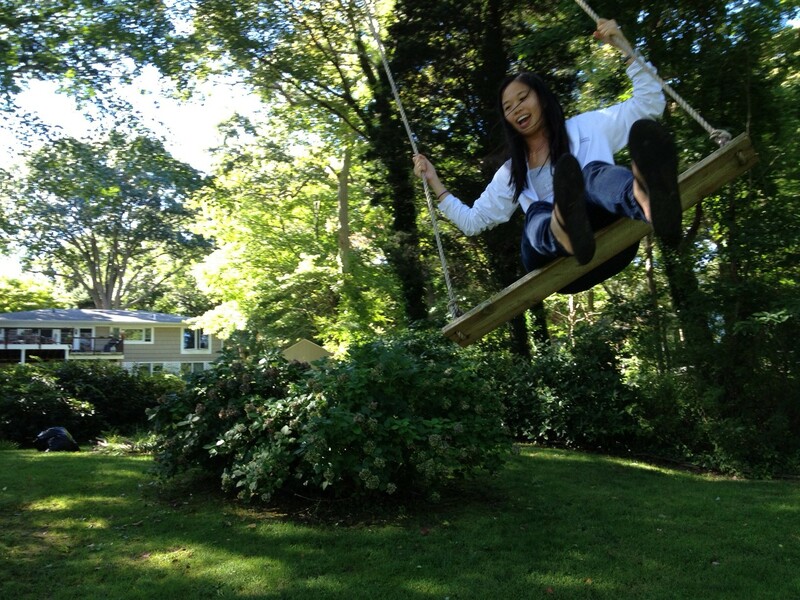 Then I jumped on their backyard swing! What an amazing end to a great summer. Categories: Uncategorized | Tags: 4 miles, Back to Football, brisket, concerts, Delaney BBQ, Fashion's night out, Madonna, NYRR | Permalink.